“I Believe: A Creed for People Who Don’t Believe in Creeds”, from Christian Faith Publishing author Douglas Bayless, is an illuminating exploration of creeds and their role and function in the defining and explanation of a religion’s beliefs, specifically Christianity, as the author takes the reader back to the early days of Christianity and shines a spotlight on the simplest and perhaps most significant creed in the history and evangelism of the faith: The Apostle’s Creed. “I Believe: A Creed for People Who Don’t Believe in Creeds” is a compelling rediscovery of the creed as a tool of evangelism. 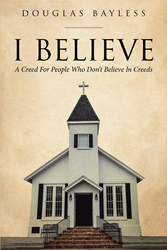 “I Believe: A Creed for People Who Don’t Believe in Creeds” is the creation of published author Douglas Bayless, a retired banker turned full-time pastor and founding minister of Lawton Church of God in Oklahoma. Published by Christian Faith Publishing, Douglas Bayless’s new book is an inspiring reminder to Christians that as believers, one must not only know what they believe but why; asking themselves the questions nonbelievers will want answered before they can share the faith. For this purpose, Bayless examines creeds in general and one creed in particular, in the context of Christ’s grand mission, which forms the groundwork for the faith and all the manifestations of it that followed. View a synopsis of “I Believe: A Creed for People Who Don’t Believe in Creeds” on YouTube. Consumers can purchase “I Believe: A Creed for People Who Don’t Believe in Creeds” at traditional brick & mortar bookstores, or online at Amazon.com, Apple iTunes store, or Barnes and Noble. For additional information or inquiries about “I Believe: A Creed for People Who Don’t Believe in Creeds”, contact the Christian Faith Publishing media department at 866-554-0919.